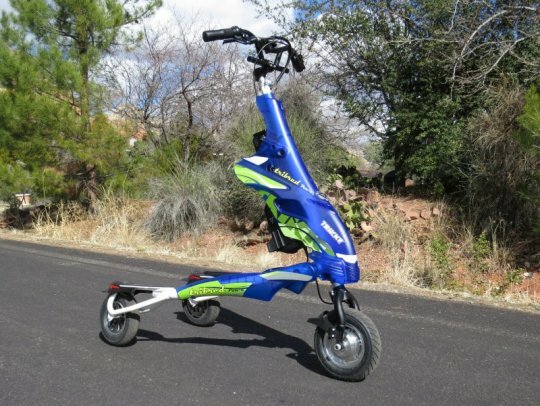 These LEV’s are an alternative to the electric bike for people who want more of a standing position, and the ability to get on and off easily. 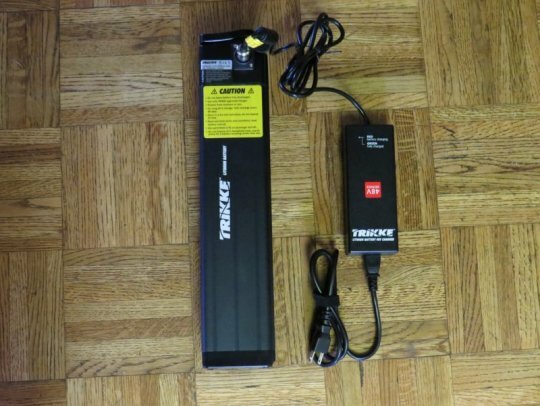 A lot of these LEV’s (including the Trikke Pon-e) also offer a foldable design for transport in a car, on mass transit, RV, boat, etc. One of the unique features of the Trikke is that it is a LEV carving vehicle. You can lean the Pon-e into turns with its cambering frame, and feel stable with its 3 points of contact that contour to the terrain you are riding over. 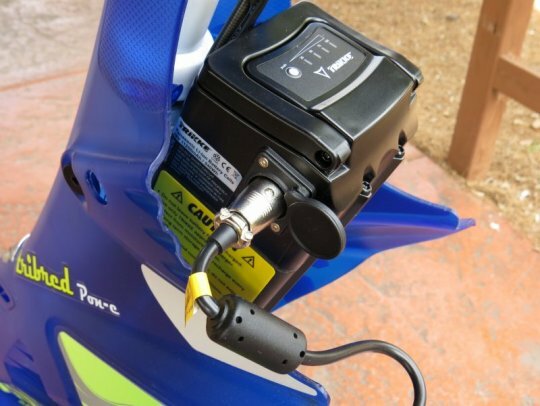 Adding your power to the vehicle is accomplished with a skate skiing type motion and you can vary the electric assist with the twist grip throttle. This in an introduction video of what the Pon-e can do. Here is a video to give you an idea of what it is like to commute with the Trikke Pon-e.
A video about getting a workout on the Trikke Pon-e with ski-like turns. Checkout more videos from Trikke at their YouTube channel. 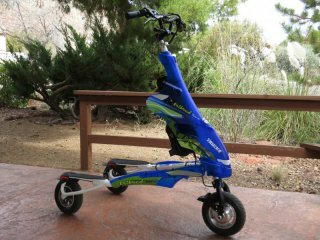 This is part 1 of the Trikke Pon-e 48V carving electric trike review and it will give you an idea of what this e-trike is all about with a bunch of pictures and info on the specifications. Part 2 of the Trikke Pon-e 48V review will give you info on ride characteristics, results from the range test, pros, cons, and overall thoughts on this e-trike. 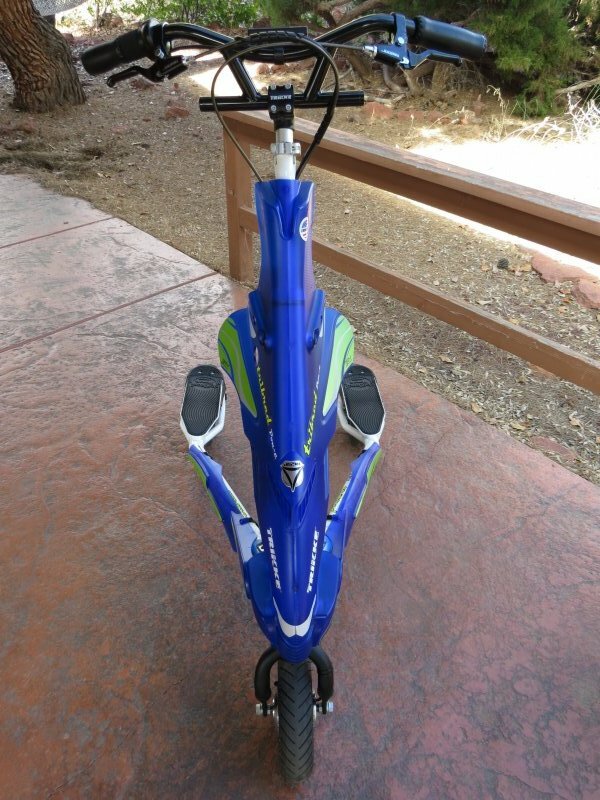 The Trikke Pon-e 48V is priced at $2,399.99 USD at the time of this review. 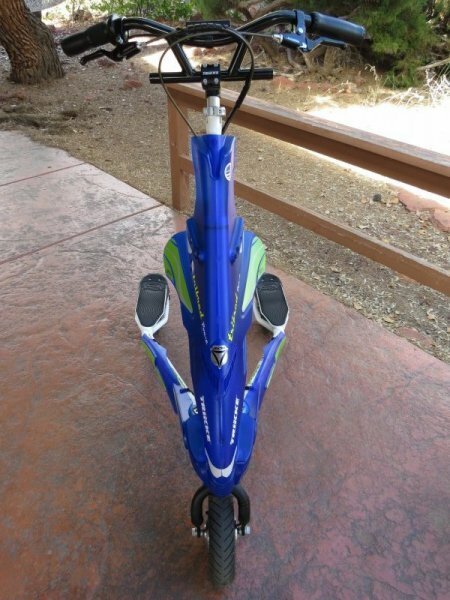 Trikke offers 2 other electric models starting at $1,369.99. They also offer non-electric models that start at $189.99. 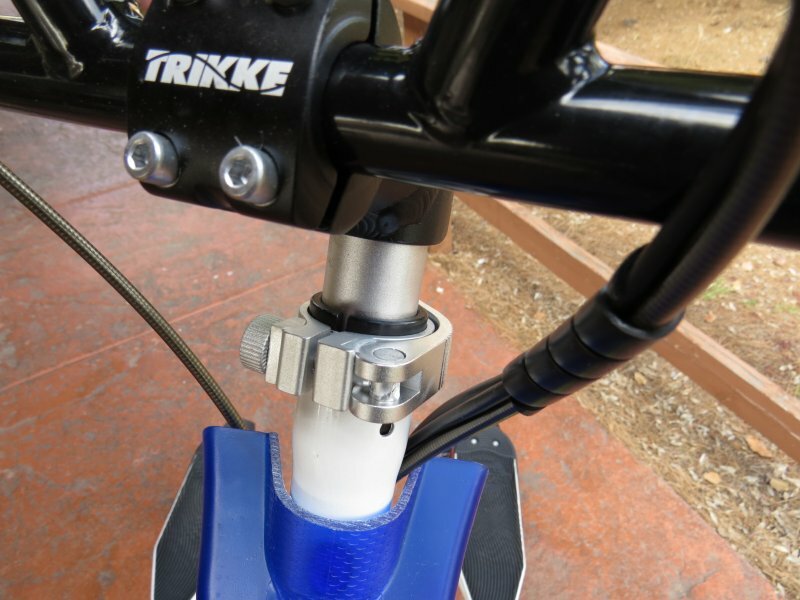 Alright, let’s get into the details of the Trikke Pon-e 48V carving electric trike! The Trikke Pon-e comes equipped with a 350 watt geared front hub motor and a 48V 11.2ah Panasonic lithium ion battery and it can travel up to 16 mph with the electric assist. Here is a view of the width of the Pon-e. At 25″ wide, it easily fits in a doorway and can carve on a typical sidewalk. The total height is between 52″-56″ depending on which height you select for the handlebars. This gives you an idea of how the Trikke frame tilts as it carves in corners. The Pon-e 48V comes with plastic fairing for added style. 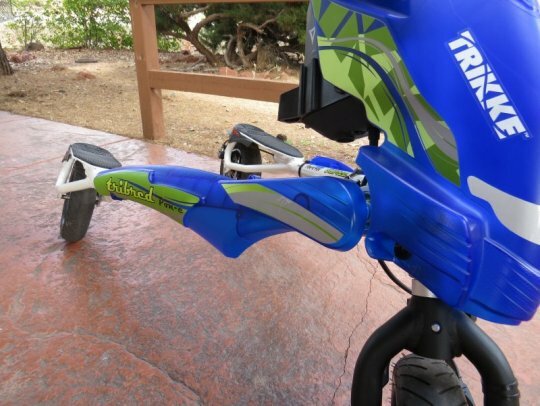 Folding the Trikke is accomplished by sliding 2 quick release levers near the 3CV cambering system. 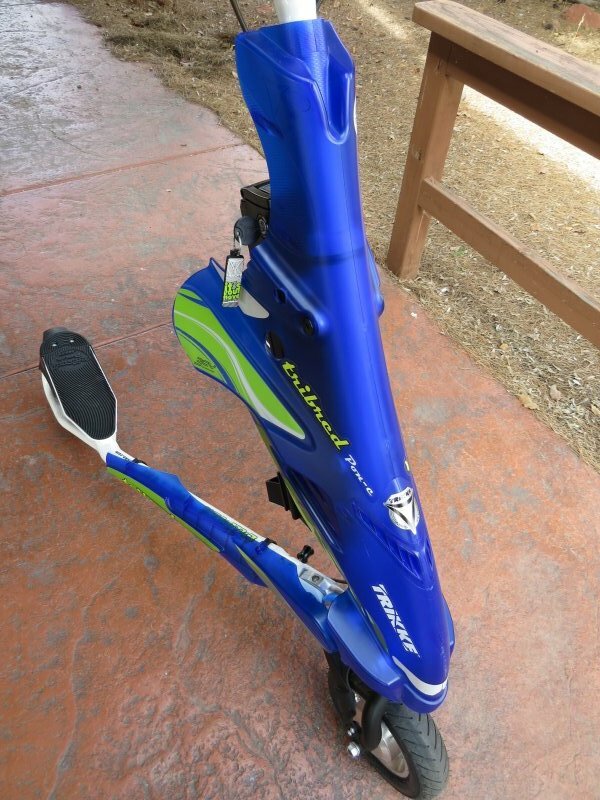 The folded dimensions are: 56″ long, 25″ wide, 14″ high and the Trikke Pon-e 48V weighs 48 lbs. The folding abilities make it handy for taking in your car, on mass transit, RV, boat, etc. Here is a view of the left and right arms with foot decks. 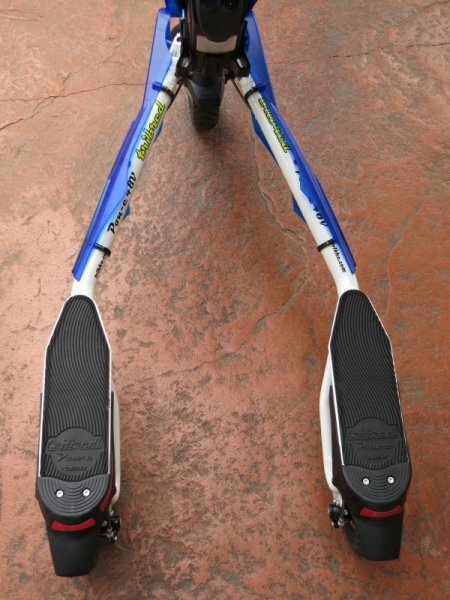 The rear wheels and brakes are under the foot decks. This is the 3CV cambering joint that allows the left and right arms to rotate and allow the frame to camber and adapt to the road surface while keeping all 3 wheels on the ground. 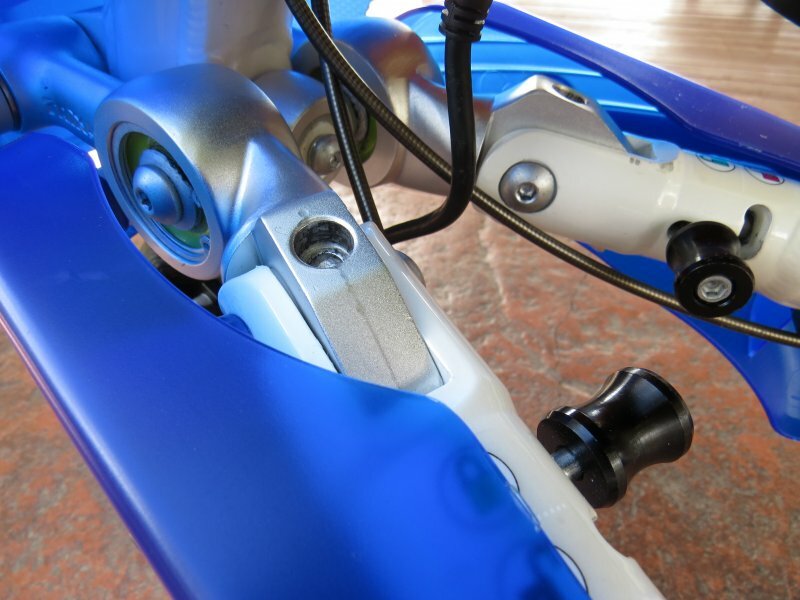 You can also see the quick release folding mechanisms (black knobs). Here is a close up of the right foot deck. There is plenty of grip on the deck. The aluminum front wheel houses the 350 watt geared front hub motor that can propel the Pon-e up to 16 mph. 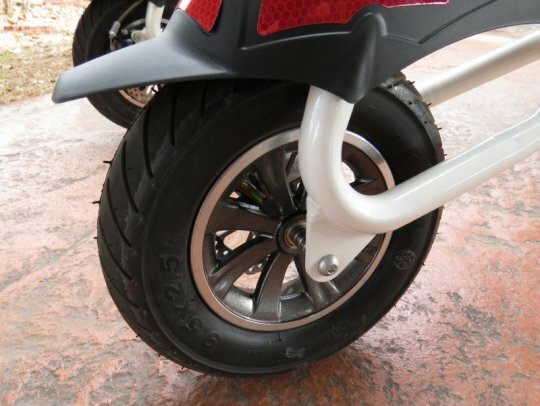 This is a 10″ front wheel with 2.5″ wide tire. 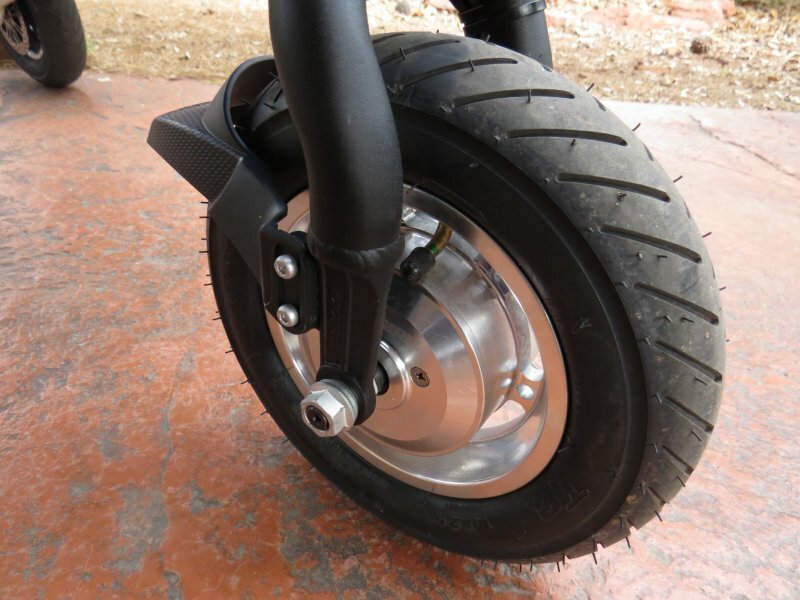 The rear aluminum mag wheels are 9.5″ in diameter with 2.5″ wide tires. Zoom mechanical disc brakes with 126mm rotors slow the Pon-e down. The disc brakes are found on each rear wheel and are controlled by their corresponding left or right brake lever on the handlebars. The handlebar command center! Left and right brake levers with the twist grip throttle on the right and the display in the center. This is the left brake lever. The grips have a leather style to them. 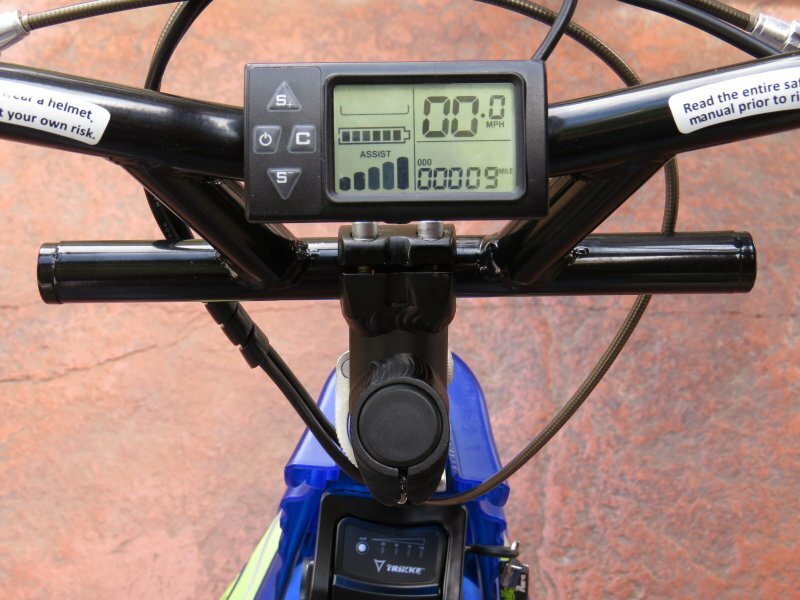 The LCD display provides info on the battery level, speed, average speed, max speed, odometer, trip distance, time, etc. There is also a way to set a “cruise control”! 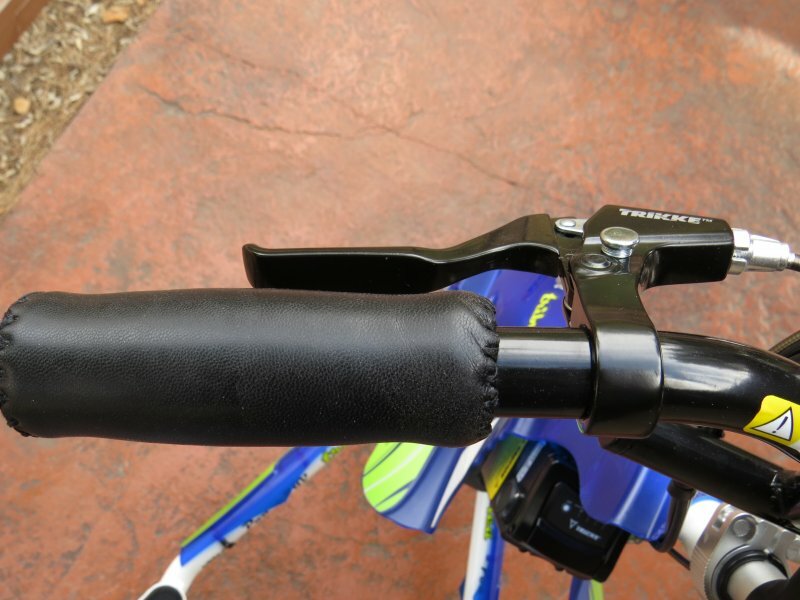 The right side of the handlebar has the right brake lever and the twist grip throttle. The brake levers come with a locking mechanism so that you can keep the Trikke from rolling when you have it parked. To engage the lock, squeeze the brake lever and push the silver button down. To release the brake, squeeze the brake lever again. 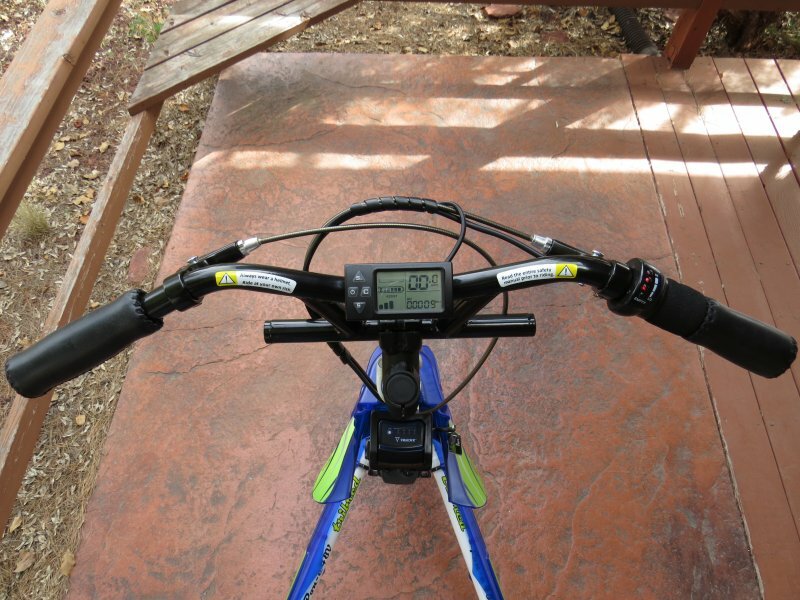 The handlebar height can be adjusted with the quick release at the top of the handlebar mast. 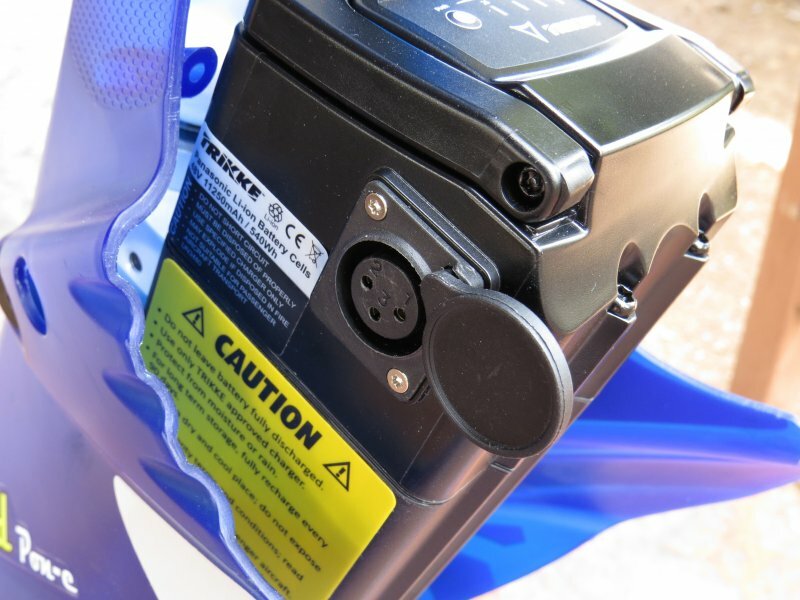 Here is the 48V 11.25ah Panasonic lithium ion battery that is located just behind the handlebar mast. There is a battery level indicator on top of the battery. There is also a battery level indicator on the handlebar display. Just below the battery is the speed switch. Level 1 (Econo) limits the speed to 12 mph max and this can be a good setting if you are just getting used to riding the Pon-e or if you are riding in congested areas. Level 2 (Express) can propel you up to 16mph, which is a good speed for more experienced riders. 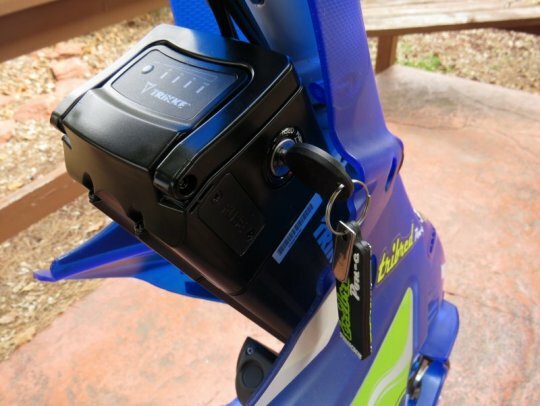 A key on the right side of the battery is used to lock the battery into place and turn the Pon-e on or off. The battery charger port is located on the left side of the battery. In this picture the charger port cover is closed. The battery charger port uncovered. 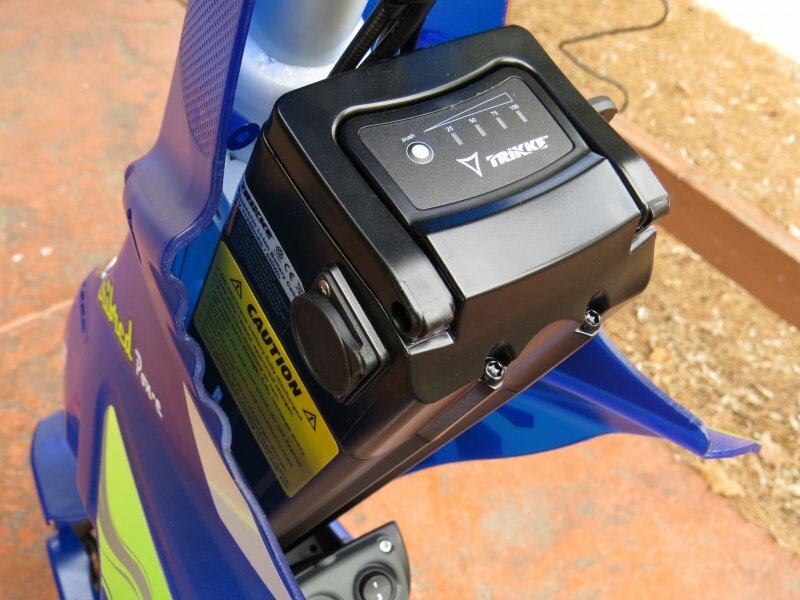 Here, the battery charger is installed. 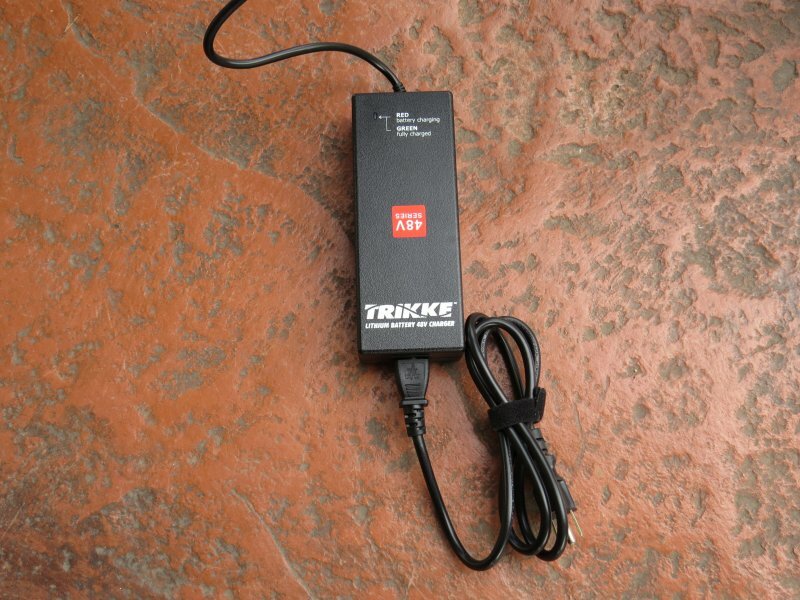 The battery charger is similar in size to a laptop computer charger. Charging the battery takes about 5 hours. There is an optional charger that can charge the battery in 3 hours. The battery is removable for storage and charging indoors. 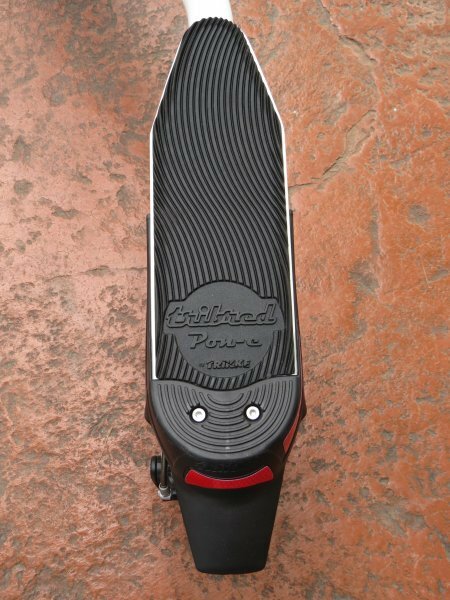 The Trikke Pon-e 48V ready to carve! Frame: Foldable 6061 T6 aluminum frame with 3CV Cambering System. 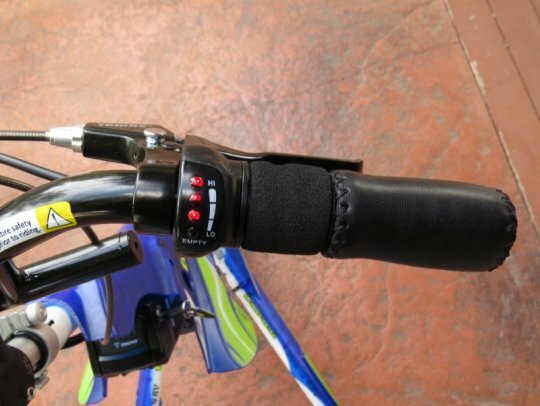 Quick release adjustable height handlebars. Motor: 350 watt (700 watt peak) geared front hub motor. Battery: 48V 11.25ah (540 Wh) Panasonic lithium battery. Charges in 5 hours with included charger. Optional 3 hour charger available. 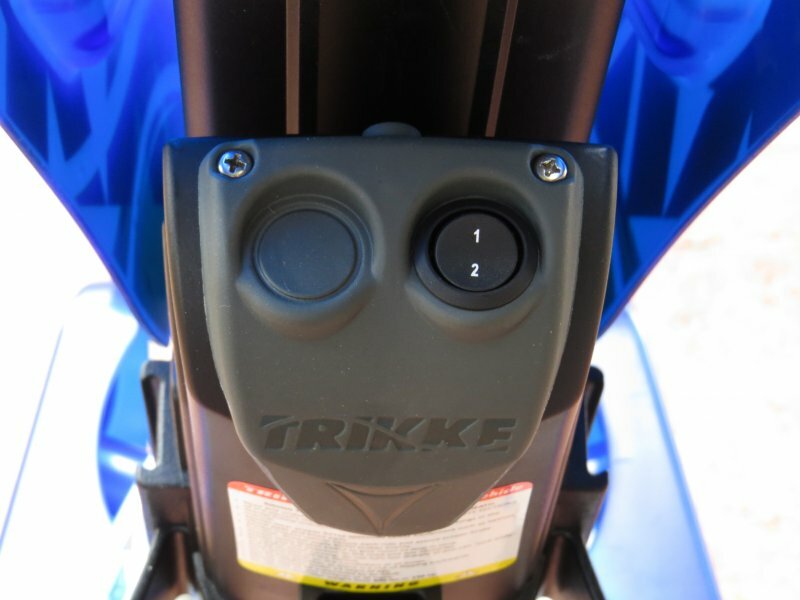 Assist Options: Twist grip throttle with 2 speed options. Speed option #1: 12mph max. Speed option #2: 16mph max. 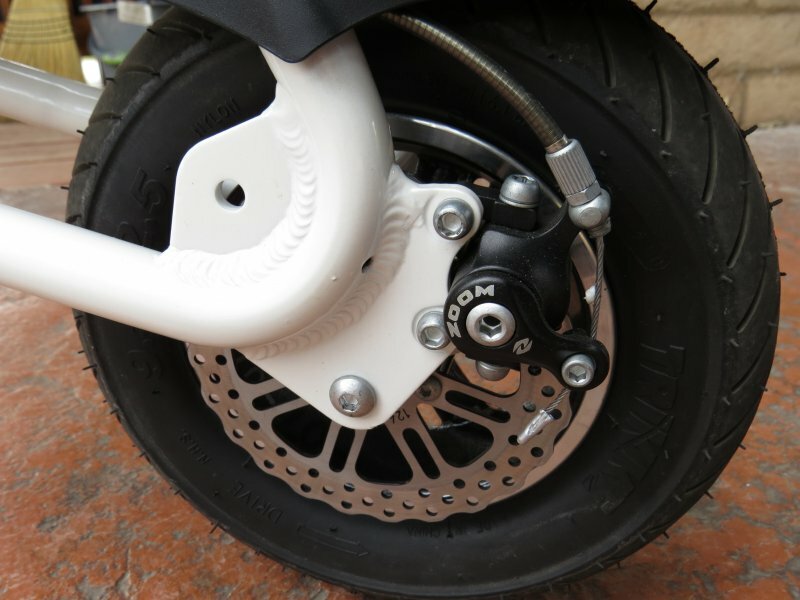 Brakeset: Zoom mechanical disc brakes with 126mm rotors on both rear wheels. 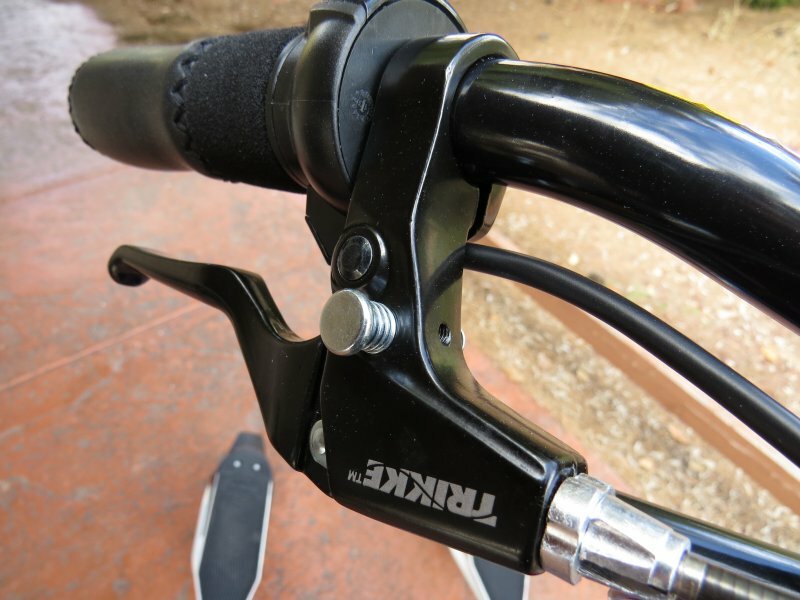 Brake levers feature locking mechanism for when the trike is parked. Tires: Motorcycle grade tires. Front: 10″ x 2.5″. Rear: 9.5″ x 2.5″. Price: $2,399.99 USD at the time of this review. 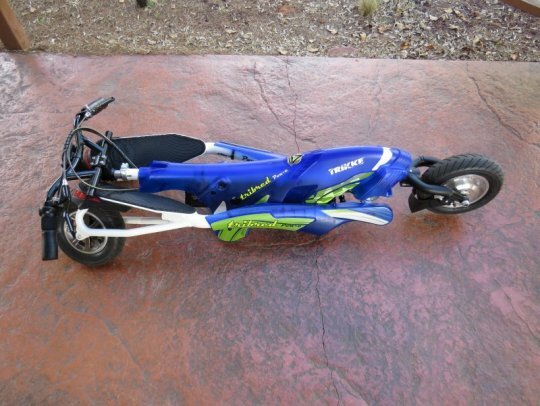 Here is a link to the specifications page of the Trikke Pon-e 48V carving electric trike. 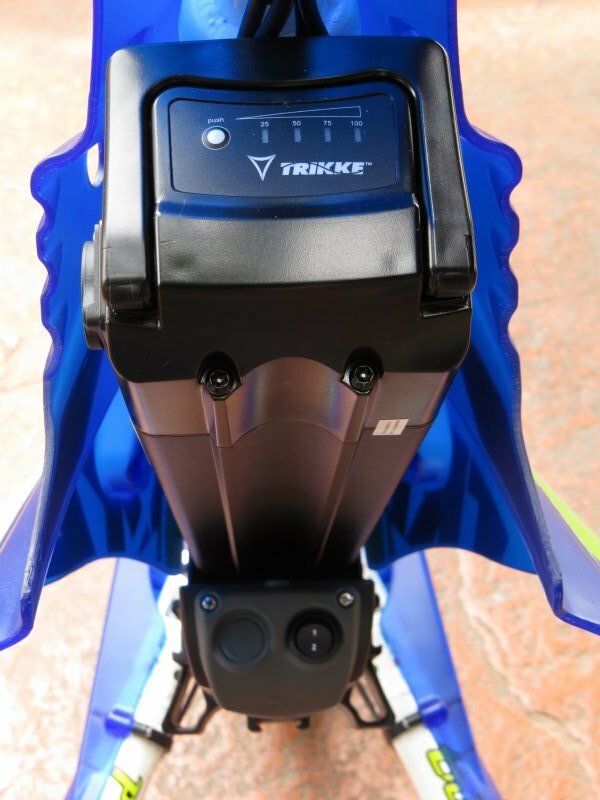 Stay tuned for part 2 of the Trikke Pon-e 48V review with info on the ride characteristics, the range test, pros, cons, and overall thoughts!